Trackmania debuted in 2003, and in the decade-plus since has evolved from a silly little confection to a gorgeous, stupidly-fast arcade racing game with a thriving online community. The latest addition to the series, Trackmania Turbo, was announced earlier this year and slated to come out in either November or December. Today, however, Ubisoft announced that, because it loves you, it's decided to delay the game into early 2016. "During the additional months, we plan to enhance the campaign and the game’s interface. 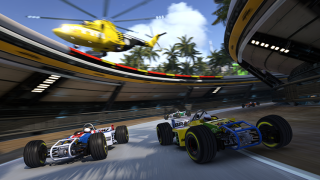 Since multiplayer is such a strong component of the Trackmania experience, we also plan to continue improving Trackmania Turbo’s multiplayer mode," Ubisoft explained on its blog. "The extra time will give us an opportunity to make sure that the online infrastructure is stable and that the online experience is a smooth one." Ubi is also working in a new mode for user-made tracks that it says will "spur competition between players," and will further fine-tune the random generator feature and improve the Trackbuilder to it more "accessible and complete." It's a bit dated at this point—it was released in 2008—but Trackmania Nations Forever is a great way to get a full-on taste of the Trackmania experience if you've missed out on it so far. It offers single-player (which isn't great) and multiplayer (which is fantastic) racing action, with a ton of tracks to tear around on. And it's free! Can't go too wrong at that price.